The CZ Model 25 (properly, Sa 25 or Sa vz. 48b/samopal vz. 48b – samopal vzor 48 výsadkový, "submachine gun model year 1948 para") was perhaps the best known of a series of Czechoslovak designed submachine guns introduced in 1948. There were four generally very similar submachine guns in this series: the Sa 23, Sa 24, Sa 25, and Sa 26. The primary designer was Jaroslav Holeček (1923–1977), chief engineer of the Česká zbrojovka Uherský Brod arms factory. The Sa 23 series utilize a straightforward blowback action, with no locked breech, and fire from the open bolt position. They also use a progressive trigger for selecting between semi-automatic fire and fully automatic fire. Lightly pulling on the trigger will fire a single shot. Pulling the trigger farther to the rear in a continuous motion will fire fully automatically, until the trigger is released or the magazine is empty. The Sa 23 series were the first production-model submachine guns with a telescoping bolt, in which the forward part of the moving bolt extends forwards past the back end of the barrel, wrapping around that barrel. This feature reduces the required length of the submachine gun significantly and allows for better balance and handling. Handling was further improved by using a single vertical handgrip housing the magazine and trigger mechanism, roughly centered along the gun's length. The gun's receiver was machined from a single circular steel tube. The design of the Sa 23 series submachine guns is most notable in the West for having inspired the open-bolt, blowback-operated, telescoping bolt design of the slightly later Uzi submachine gun. The Sa 23 (vz. 48a) was the first variant, using a fixed wood stock and firing standard 9×19mm Parabellum ammunition. Has a straight vertical pistol grip and ammunition magazine. Magazines were issued with 24 and 40 round capacity. The Sa 25 (vz. 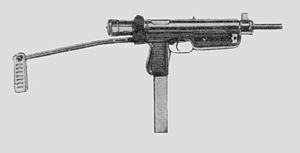 48b) was the second and perhaps best known variant, using a folding metal stock, still firing 9×19mm Parabellum ammunition. Other than the folding stock, is identical to the Sa 23 and uses the same 24 and 40 round magazines. The Sa 24 and Sa 26 were introduced after Czechoslovakia joined the Warsaw Pact, and were redesigned to fire 7.62×25mm Tokarev standard Soviet type pistol ammunition. The Sa 24 (vz. 48a/52) corresponds to the Sa.23, using a fixed wood stock and firing 7.62×25mm Tokarev ammunition. Can be visually distinguished from Sa.23 as it has a slightly forwards-slanted pistol grip and ammunition magazine, though the main receiver and other components are otherwise visibly identical. It was issued with 32-round magazines. The Sa 26 (vz. 48b/52) corresponds to the Sa.25, with a folding metal stock but otherwise identical to the Sa.24, using the same 32-round magazines. The Sa 23 and 25 models were used by Cuba during the 1960s and 70s, and some can be seen in photos of the Bay of Pigs invasion. After the Sa 25 was declared obsolete in 1968, many of the 9mm weapons were sold around the nation. The surplus weapons were exported to other communist countries including North Vietnam. A somewhat-modified copy of the 9×19mm Parabellum model was produced in Rhodesia in the early 1970s as the LDP and given the nickname "Rhogun". Manufacture was later transferred to South Africa where it was briefly marketed as the Sanna 77 in semi-automatic fire only. Many parts kits were imported into the U.S. in the early 2000s with the receivers demilled incorrectly (they had been saw cut instead of torch cut). This prompted the Bureau of Alcohol, Tobacco, Firearms and Explosives to send a letter in 2007 to distributors asking for the receiver pieces back which was then forwarded to many of the final purchasers. The letter only asked for the receiver pieces back, but as these had key parts welded onto them (such as the magazine well) it is likely some receiver pieces were returned with vital portions of the firearm still attached. Parts kits available on the secondary market have since risen in value and many of the ones that are available are incomplete. ^ a b Russell, Lee E. (28 Mar 1985). Grenada 1983. Men-at-Arms 159. Osprey Publishing. p. 45. ISBN 9780850455830. ^ Jowett, Philip (2016). Modern African Wars (5): The Nigerian-Biafran War 1967-70. Oxford: Osprey Publishing Press. p. 22. ISBN 978-1472816092. ^ a b c d e f g h i j k l Jones, Richard D.; Ness, Leland S., eds. (January 27, 2009). Jane's Infantry Weapons 2009/2010 (35th ed.). Coulsdon: Jane's Information Group. ISBN 978-0-7106-2869-5. ^ a b c Bonn International Center for Conversion; Bundeswehr Verification Center. "SA vz 23 / 25". SALW Guide: Global distribution and visual identification. Retrieved 31 August 2018. ^ a b c Bonn International Center for Conversion; Bundeswehr Verification Center. "SA vz 24 / 26". SALW Guide: Global distribution and visual identification. Retrieved 31 August 2018. ^ a b c d Popenker, Maxim. "Sa. 23". Modern Firearms. ^ Rob Krott (April 2000). "The Bay of Pigs Museum: Playa Giron, Cuba". Small Arms Review. Vol. 3 no. 7. Chipotle Publishing. Retrieved 1 February 2017. ^ Thomas, Nigel; Caballero Jurado, Carlos (25 Jan 2002). Germany's Eastern Front Allies (2): Baltic Forces. Men-at-Arms 363. Osprey Publishing. p. 40. ISBN 9781841761930. Hogg, Ian V. (1979). Guns and How They Work. New York: Everest House. p. 157. ISBN 0-89696-023-4. Jones, Richard (2009). Jane's Infantry Weapons 2009-2010. Jane's Information Group. p. 894. ISBN 0-7106-2869-2. This page was last edited on 25 March 2019, at 20:37 (UTC).